Hillary Clinton’s advocacy for an obscure government agency often accused of cronyism exemplifies her status as the consummate self-dealing Washington insider, according to critics of the likely Democratic presidential nominee. 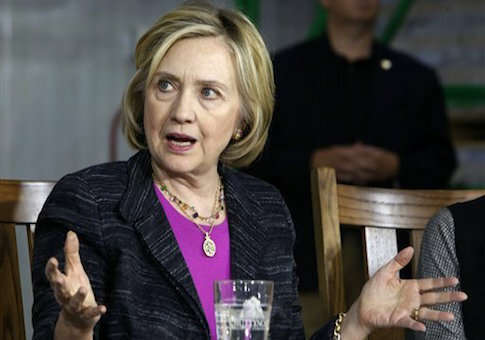 Freedom Partners, a trade association backed by libertarian philanthropists Charles and David Koch, sought to tie Clinton’s advocacy on behalf of the U.S. Export-Import Bank on Friday to large corporate donations to her family’s foundation. A review of the Clinton Foundation’s donor rolls reveals financial support by a number of Ex-Im beneficiaries, including foreign state-owned corporations and a French bank that last year admitted to violating sanctions against a state-sponsor of terrorism. The group also pointed to the bank’s support for a number of Clinton Foundation donors, including Boeing and General Electric, whose exports have received taxpayer backing through the agency. Even Ex-Im’s chairman is a foundation donor, they noted. The Ex-Im Bank is a relatively small government agency in terms of dollars spent. It authorized roughly $20 billion in financing last fiscal year for the purchase of U.S. exports by foreign governments and corporations. Despite its size, the agency has become a flashpoint in the debate over the role of U.S. government subsidies in the global economy and the influence of powerful industry forces in federal policymaking. The House of Representatives is currently debating whether to reauthorize the bank. Its funding expires next month. Clinton used a trip through the presidential swing state of New Hampshire on Friday to push for the bank’s reauthorization, claiming that it "supports up to 164,000 jobs." "It is wrong that Republicans in Congress are trying to cut off this vital lifeline for American small businesses," she said. "They would rather threaten the livelihoods of those 164,000 jobs rather than stand up to the tea party and talk radio." The bank’s critics say that this argument is disingenuous. "The result [of Ex-Im subsidies] is more jobs for subsidized exporters and fewer jobs for everyone else," according to Tim Carney, a visiting fellow at the American Enterprise Institute. Freedom Partners brushed off the bank’s simulative effects, noting that Ex-Im-backed employers have donated large sums to the Clinton Foundation. Despite Clinton’s claim that Ex-Im is designed to help small businesses, the largest beneficiary of Ex-Im subsidies is airline giant Boeing, which has donated between $1 million and $5 million to the Clinton Foundation. Another top beneficiary, General Electric, has given between $500,000 and $1 million. "This is business as usual in the world of politics: big companies buying access and political favors from candidates or lawmakers in office" said Veronique de Rugy, a senior research fellow at the Mercatus Center and a frequent Ex-Im critic, of the companies’ contributions. De Rugy released a study in April identifying the top foreign-owned beneficiaries of Ex-Im financing. A number of them have either donated to the Clinton Foundation or received government-guaranteed loans from a bank that has. The top foreign beneficiary is state-owned Mexican oil company Pemex, a Clinton Foundation donor. Second on the list is Emirates Airline, the state-owned airline of the United Arab Emirates, a seven-figure donor. French bank BNP Paribas, also a Clinton Foundation contributor, has provided Ex-Im-guaranteed loans for a number of companies on De Rugy’s list, including Emirates, Pemex, Irish airline RyanAir, and Refinería de Cartagena S.A., a subsidiary of Colombia’s state-owned oil company. Paribas has faced controversy since last year, when it pled guilty to federal charges stemming from its efforts to evade international sanctions on Iran. The bank has provided billions in federally backed loans to Ex-Im beneficiaries. "There is no reported link between Ex-Im and the revelations of misconduct by BNP Paribas," noted Mercatus’ Diane Katz, a co-author of De Rugy’s study, in a previous report for the Heritage Foundation. "But fraud and corruption are among a long list of operational problems at the bank, which is a conduit for corporate welfare and beset by mismanagement, inefficiency and risk." Freedom Partners leveled similar allegations, pointing to ties between Clinton and Ex-Im chairman Fred Hochberg. Hochberg is a long-time supporter of Clinton’s political efforts. He is a prominent Clinton donor and fundraiser, and has also contributed to the Clinton Foundation. "Her support for the Ex-Im Bank is a case study in cronyism and corporate welfare," according to Freedom Partners spokesman James Davis. "No one should be surprised that Secretary Clinton won’t take a position on free trade, but supports, in the name of trade, using tax dollars to prop up companies that donated millions to her foundation," Davis said in a statement on Freedom Partners’ website. Efforts to paint Ex-Im as a case of Clinton cronyism could revive decades-old scandals involving favors handed out to high-dollar Democratic donors. Davis noted in an email that Hochberg was one of a number of such donors to stay in the White House’s Lincoln Bedroom during Bill Clinton’s presidency. Democratic Party donor solicitations offering overnight stays in the bedroom to high-dollar contributors became a symbol of corruption in the 1990s. "It's difficult to imagine a clearer example of cronyism" than Clinton’s advocacy for Hochberg’s agency, Davis said. Neither Ex-Im nor the Clinton Foundation returned requests for comment by press time. This entry was posted in Issues and tagged Ex-Im Bank. Bookmark the permalink.